This is a close up of MinION. A pocket-sized device that can rapidly determine the sequence of an organism's DNA has shown its potential in disease detection, according to a study published in the open access, open data journal GigaScience. In the first analysis of its kind, researchers were able to use the device to accurately identify a range of closely-related bacteria and viruses within six hours, demonstrating the potential for this technology to be used as a mobile diagnostic clinic during outbreaks. 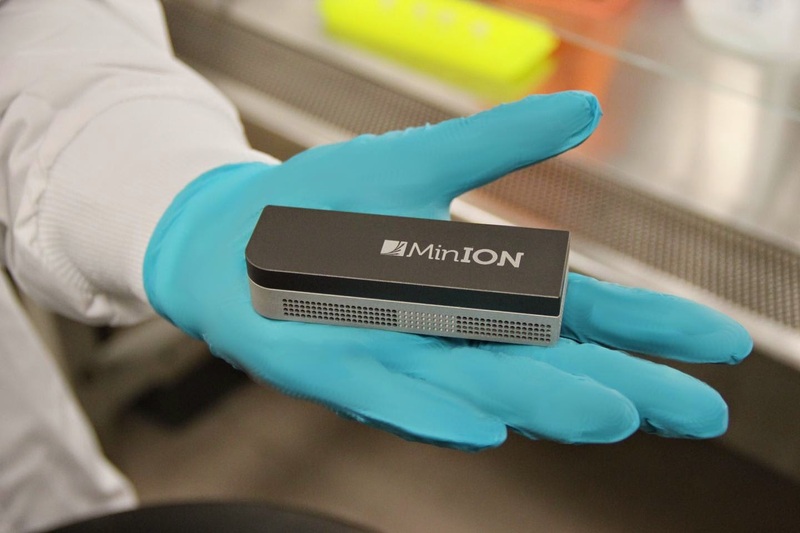 The MinION™ 'Nanopore sequencer' is a low-cost palm-sized sequencing device from Oxford Nanopore Technologies that has been made available to some research groups for testing. 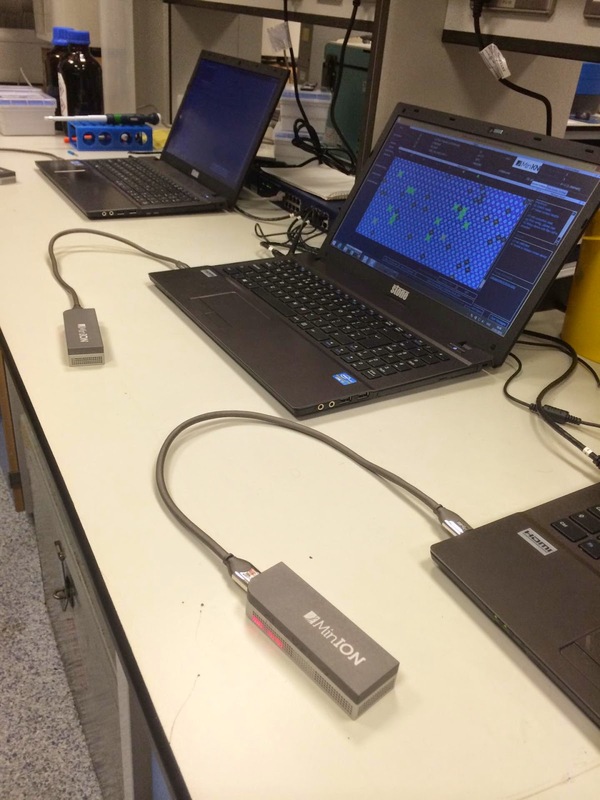 It is powered and operated via a USB connection plugged into a laptop, which means that it could potentially be used for on-site clinical analyses in remote locations, negating the need for samples to be sent off to laboratories. "Being able to accurately identify and characterize strains of viruses and bacteria using a mobile platform is attractive to anyone collecting biological samples in the field. And we expect that as the technology improves, the sequencing will generally become cheaper, faster and more accurate, and could have further clinical applications." The researchers were able to use the MinION™ to accurately identify and differentiate viral and bacterial species from samples. Within six hours, the device generated sufficient data to identify an E. coli sample down to species level, and three poxviruses (cowpox, vaccinia-MVA, and vaccinia-Lister) down to strain level. The device was able to distinguish between the two vaccinia strains despite them being closely related and over 98% similar to each other. The technology relies on protein 'nanopores' to determine the sequence of a strand of DNA. At the core of the protein is a hollow tube only a few nanometres in diameter, through which a single DNA strands can pass. As the DNA strand passes through the nanopore, it causes characteristic electrical signatures, from which bases can be identified, and the sequence of the strand determined. Despite MinION™'s observed read error rate of 30%, which is higher than that of other DNA sequencing methods, the team was able to overcome some of the current limitations by utilizing an approach based on amplified DNA (an 'amplicon' approach). This allowed them to confidently differentiate between closely-related strains. The amplicon approach allows for the analysis of more complex mixed samples containing a range of organisms in a short runtime. For whole genome sequencing approaches in less pure samples, they note that improvements will need to be made as the technology matures. The authors state it would be difficult to accurately characterize pathogens within a complex sample in six hours without applying the amplicon methodology. Scientists at the University of Copenhagen have captured thousands of progenitor cells of the pancreas on video. They have filmed the cells making decisions to both divide and expand the organ or to specialize into the endocrine cells that regulate our blood sugar levels. The new study reveals that stem cells behave as people in a society, making individual choices but with enough interactions to bring them to their end-goal. The results could eventually lead to a better control over the production of insulin-producing endocrine cells for diabetes therapy. The research is published in the scientific journal PLOS Biology. 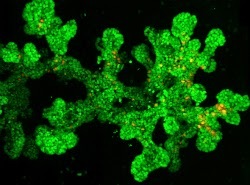 In a joint collaboration between the University of Copenhagen and University of Cambridge, Professor Anne Grapin- Botton and a team of researchers including Assistant Professor Yung Hae Kim from DanStem focused on marking the progenitor of the embryonic pancreas, commonly referred to as ‘mothers’, and their ‘daughters’ in different fluorescent colours and then captured them on video to analyse how they make decisions. Prior to this work, there were methods to predict how specific types of pancreas cells would evolve as the embryo develops. However, by looking at individual cells, the scientists found that even within one group of cells presumed to be of the same type, some will divide many times to make the organ bigger while others will become specialized and will stop dividing. The scientists witnessed interesting occurrences where the ‘mother’ of two ‘daughters’ made a decision and passed it on to the two ‘daughters’ who then acquired their specialization in synchrony. By observing enough cells, they were able to extract logic rules of decision-making, and with the help of Dr Pau Rué, a mathematician from the University of Cambridge, they developed a mathematical model to make long-term predictions over multiple generations of cells. "It is the first time we have made movies of a quality that is high enough to follow thousands of individual cells in this organ, for periods of time that are long enough for us to follow the slow decision process. The task seemed daunting and technically challenging, but fascinating,” says Professor Grapin-Botton. "With these movies we can see and quantify the dynamics of decisions in each cell in the context of the organ, in a way that will inspire the study of many other organs," says Assistant Professor Yung Hae Kim. "To complement the movies, which are done on isolated pancreas, we developed a method to visualize the family tree of cells in the untouched organ. We initially focused on one generation but now we are also observing their descendants over multiple generations," Kim elaborates. The project has been focused on basic research and is highly theoretical, but it now provides tools to control whether a cell should expand or specialize into an endocrine cell on its way to producing insulin. “It is a worldwide quest to produce such insulin-producing cells from stem cells, for their transplantation in diabetic patients. In the future, this could be done by increasing the probability of specialization or by pushing ‘mother’ cells to pass on the decision to specialize to their two daughters”, Grapin-Botton concludes. In a statement released on Thursday, the International Society for Stem Cell Research called for a moratorium on attempts at clinical application of nuclear genome editing of the human germ line to enable more extensive scientific analysis of the potential risks of genome editing and broader public discussion of the societal and ethical implications. Technologies used to introduce changes into the DNA sequence of cells have advanced rapidly, making genome editing increasingly simple. Genome editing is feasible, not just in the somatic cells of an adult organism, but also in early embryos, as well as the gametes (sperm and egg) that carry the inheritable, germ line DNA. Research involving germ line nuclear genome editing has been performed to date in many organisms, including mice and monkeys, and applications to human embryos are possible. The ISSCR statement raises significant ethical, societal and safety considerations related to the application of nuclear genome editing to the human germ line in clinical practice. Current genome editing technologies carry risks of unintended genome damage, in addition to unknown consequences. Moreover, consensus is lacking on what, if any, therapeutic applications of germ line genome modification might be permissible. The statement calls for a moratorium on attempts to apply nuclear genome editing of the human germ line in clinical practice, as scientists currently lack an adequate understanding of the safety and potential long term risks of germ line genome modification. Moreover, the ISSCR asserts that a deeper and more rigorous deliberation on the ethical, legal and societal implications of any attempts at modifying the human germ line is essential if its clinical practice is ever to be sanctioned. In calling for the above moratorium, the ISSCR is not taking a position on the clinical testing of mitochondrial replacement therapy, a form of germ line modification that entails replacing the mitochondria (found outside the nucleus) in the eggs of women at risk of transmitting certain devastating diseases to their children. 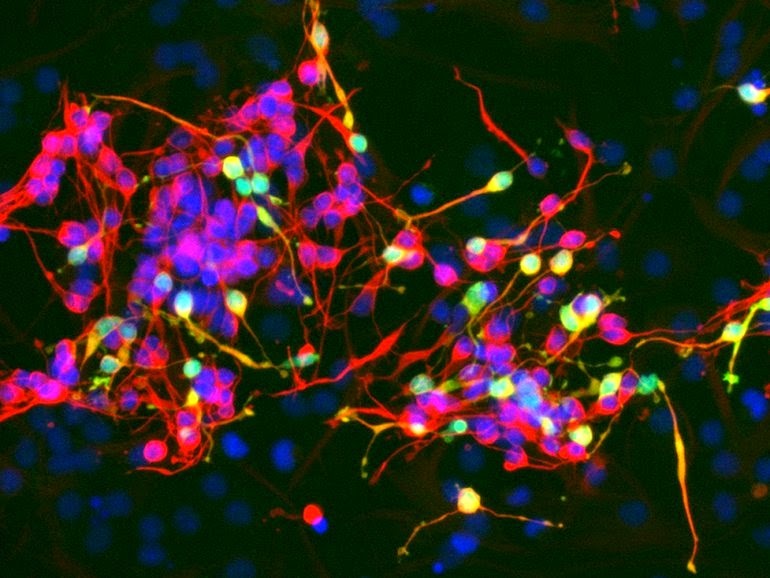 A research team at UC San Francisco has discovered an RNA molecule called Pnky that can be manipulated to increase the production of neurons from neural stem cells. The research, led by neurosurgeon Daniel A. Lim, MD, PhD, and published on March 19, 2015 in Cell Stem Cell, has possible applications in regenerative medicine, including treatments of such disorders as Alzheimer's disease, Parkinson's disease and traumatic brain injury, and in cancer treatment. Pnky is one of a number of newly discovered long noncoding RNAs (lncRNAs), which are stretches of 200 or more nucleotides in the human genome that do not code for proteins, yet seem to have a biological function. The name, pronounced "Pinky," was inspired by the popular American cartoon series Pinky and the Brain. "Pnky is encoded near a gene called 'Brain,' so it sort of suggested itself to the students in my laboratory," said Lim. Pnky also appears only to be found in the brain, he noted. Co-first authors Alex Ramos, PhD, and Rebecca Andersen, who are students in Lim's laboratory, first studied Pnky in neural stem cells found in mouse brains, and also identified the molecule in neural stem cells of the developing human brain. They found that when Pnky was removed from stem cells in a process called knockdown, neuron production increased three to four times. "It is remarkable that when you take Pnky away, the stem cells produce many more neurons," said Lim, an assistant professor of neurological surgery and director of restorative surgery at UCSF. "These findings suggest that Pnky, and perhaps lncRNAs in general, could eventually have important applications in regenerative medicine and cancer treatment." Lim observed that Pnky has an intriguing possible connection with brain tumours. Using an analytical technique called mass spectrometry, Ramos found that Pnky binds the protein PTBP1, which is also found in brain tumours and is known to be a driver of brain tumour growth. In neural stem cells, Pnky and PTBP1 appear to function together to suppress the production of neurons. "Take away one or the other and the stem cells differentiate, making more neurons," said Lim. "It is also possible that Pnky can regulate brain tumour growth, which means we may have identified a target for the treatment of brain tumours." Lim said that the larger significance of the research is that it adds to a growing store of knowledge about lncRNAs, previously unknown sections of the genome that some biologists have referred to as the "dark matter" of the human genome. "Recently, over fifty thousand human lncRNAs have been discovered. Thus, there may be more human lncRNAs than there are genes that code for proteins," said Lim. "It is possible that not all lncRNAs have important biological functions, but we are making a start toward learning which ones do, and if so, how they function. It's a new world of experimental biology, and the students in my lab are right there on the frontier." Lim had particular praise for Ramos, an MD-PhD student in the UCSF Medical Scientist Training Program, and Andersen, who has a fellowship from the prestigious National Science Foundation (NSF) Graduate Research Fellowship Program. "They have been a great collaborative team and an inspiration to others in my lab," said Lim. "I think they represent the pioneering, investigative spirit of the UCSF student body." Stem cells can have a strong sense of identity. Taken out of their home in the hair follicle, for example, and grown in culture, these cells remain true to themselves. After waiting in limbo, these cultured cells become capable of regenerating follicles and other skin structures once transplanted back into skin. It's not clear just how these stem cells – and others elsewhere in the body – retain their ability to produce new tissue and heal wounds, even under extraordinary conditions. New research at Rockefeller University has identified a protein, Sox9, which takes the lead in controlling stem cell plasticity. In a paper published March 18 in Nature, the team describes Sox9 as a "pioneer factor" that breaks ground for the activation of genes associated with stem cell identity in the hair follicle. "We found that in the hair follicle, Sox9 lays the foundation for stem cell plasticity. First, Sox9 makes the genes needed by stem cells accessible, so they can become active. Then, Sox9 recruits other proteins that work together to give these "stemness" genes a boost, amplifying their expression," says study author Elaine Fuchs, Rebecca C. Lancefield Professor, Robin Chemers Neustein Laboratory of Mammalian Cell Biology and Development. "Without Sox9, this process never happens, and hair follicle stem cells cannot survive." Sox9 is a type of protein called a transcription factor, which can act like a volume dial for genes. When a transcription factor binds to a segment of DNA known as an enhancer, it cranks up the activity of the associated gene. Recently, scientists identified a less common, but more powerful version: the super-enhancer. Super-enhancers are much longer pieces of DNA, and host large numbers of cell type-specific transcription factors that bind cooperatively. Super-enhancers also contain histones, DNA-packaging proteins, which harbour specific chemical groups – epigenetic marks – that make genes they are associated with accessible so they can be expressed. Using an epigenetic mark associated specifically with the histones of enhancers, first author Rene Adam, a graduate student in the lab, and colleagues, identified 377 of these high-powered gene-amplifying regions in hair follicle stem cells. The majority of these super-enhancers were bound by at least five transcription factors, often including Sox9. Then, they compared the stem cell super-enhancers to those of short-lived stem cell progeny, which have begun to choose a fate, and so lost the plasticity of stem cells. These two types of cells shared only 32 percent of their super-enhancers, suggesting these regions played an important role in skin cell identity. By switching off super-enhancers associated with stem cell genes, these genes were silenced while new super-enhancers were being activated to turn on hair genes. To better understand these dynamics, the researchers took a piece of a super-enhancer, called an epicentre, where all the stem cell transcription factors bind, and they linked it to a gene that glowed green whenever the transcription factors were present. In living mice, all the hair follicle stem cells glowed green, but surprisingly, the green gene turned off when the stem cells were taken from the follicle and placed in culture. When they put the cells back into living skin, the green glow returned. Another clue came from experiments performed by Hanseul Yang, another student in the lab. By examining the new super-enhancers that were gained when the stem cells were cultured, they learned that these new super-enhancers bound transcription factors that were known to be activated during wound-repair. When they used one of these epicentres to drive the green gene, the green glow appeared in culture, but not in skin. When they wounded the skin, then the green glow switched on. "We were learning that some super-enhancers are specifically activated in the stem cells within their native niche, while other super-enhancers specifically switch on during injury," explained Adam. "By shifting epicentres, you can shift from one cohort of transcription factors to another to adapt to different environments. But we still needed to determine what was controlling these shifts." The culprit turned out to be Sox9, the only transcription factor expressed in both living tissue and culture. Further experiments confirmed Sox9's importance by showing, for example, that removing it spelled death for stem cells, while expressing it in the epidermis gave the skin cells features of hair follicle stem cells. These powers seemed to be special to Sox9, placing it atop the hierarchy of transcription factors in the stem cells. Sox9 is one of only a few pioneer factors known in biology which can initiate such dramatic changes in gene expression. "Importantly, we link this pioneer factor to super-enhancer dynamics, giving these domains a 'one-two punch' in governing cell identity. In the case of stem cell plasticity, Sox9 appears to be the lead factor that activates the super-enhancers that amplify genes associated with stemness," Fuchs says. "These discoveries offer new insights into the way in which stem cells choose their fates and maintain plasticity while in transitional states, such as in culture or when repairing wounds."